A 35 years old man did a health test at Primary Care (PC) and his blood pressure (one measurement) was 153 mm Hg Systolic blood pressure and 96 mm Hg diastolic blood pressure. He was told he will be contacted later for an intervention visit. As the man know of my biopsychosocial stress medicine work he called me and said “Please can you help me .. ” and told about the PC visit. He visits my clinic for 1 hour two weeks later where we did (i) a stressogram (a kind of psychophysiological stress profiling, where also blood pressure is measured each 2 minutes during different conditions), (ii) I showed him his results and (iii) then I testing his capacity to direct lower his blood pressure. As I observed that his blood pressure referred to his autonomic nervous system (ANS) behaviors, I expected he could lower it with some strategies we always use for capacity testing. 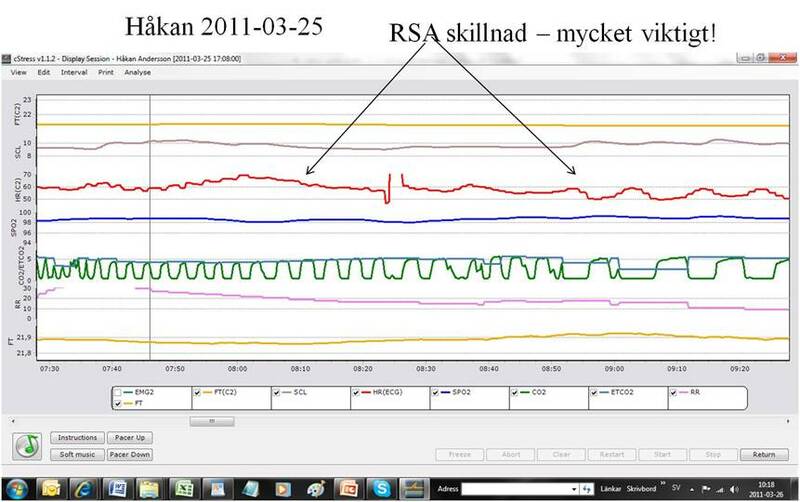 Yes, he could normalize it (both blood pressure and ANs-parameters) directly as show in his data below, e.g. changes in Respiratory Sinus Arrhythmia. Before he left he was sure how to practice (based on his own data collected during the visit) and which he did. After 3 month he was called to come back to PC, where he was greeted by a physician with “you have too high blood pressure and I must prescribed medication.” The man refused. “Hmmm, you can get stroke!” The man refused again and said “I can manage it myself” “Hmmm, we measure ..” data was very good, “hmmm we test again” = data very good … ”we test again” = data was even better …. The physician shook his head – did not asked how the man could control his blood pressure. Now (three years ago) man reports around 130 mm Hg and 80 mm Hg. NB the health care providers are expected to follow their instructions and what they have learned in their certified education, which is not about how to use biopsychosocial medicine tools for controlling blood pressure – which I am very sorry to say, and have said during 25 years. Patients suffering from hypertension during many years need metabolic tests where also Mg++ and D-vitamin is not to be forgotten.